The simple however elegant style offers a up to date look to the whole set that conjointly consists of a combine of hanging sort earrings sharing a similar style. The green emerald base of gold plated brass metal balls can be viewed through the netted design that adorns the metal covering. The simple yet Read More..elegant design gives a contemporary look to the entire set which also consists of a pair of hanging type earrings sharing the same design. 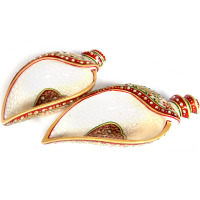 Show Less..
A symbol of great artistry and sculpting, the conch compliments idea of dining just perfectly.